Real estate investment trust Kilroy Realty announced yesterday its second-quarter dividend of $0.35 per share, the same rate it's paid since 2009. The board of directors said the quarterly dividend is payable on July 17 to the holders of record at the close of business on June 28. The REIT has made a quarterly payout every year since 1997. The board also declared dividends for its two classes of preferred shares. On the 6.875% Series G cumulative redeemable preferred stock it will pay a dividend of $0.4296875 per share. For the 6.375% Series H cumulative redeemable preferred stock Kilroy will pay a dividend of $0.3984375 per share. Both preferred dividends will be payable on August 15 to shareholders of record on July 31. The regular dividend payment equates to a $1.40-per-share annual dividend, yielding 2.4% based on the closing price of Kilroy Realty's stock on May 23. 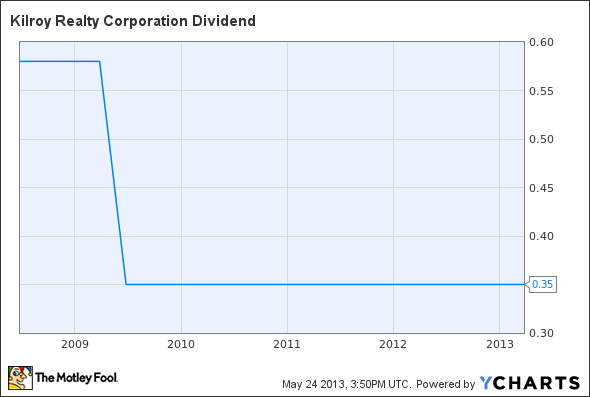 The article Kilroy Realty Maintains Dividend at $0.35 originally appeared on Fool.com.